We described once before some aspects of the storied career of the W.T. Preston, the snagboat that served the Corps of Engineers and the people of Puget Sound for more than half a century, 1929-1981. We are fortunate to have access to a series of oral histories conducted by Pam Negri in 1981 and 1982 with officers and crewmembers of the vessel. The oral history project was commissioned by the Corps of Engineers, Seattle District. The W.T. 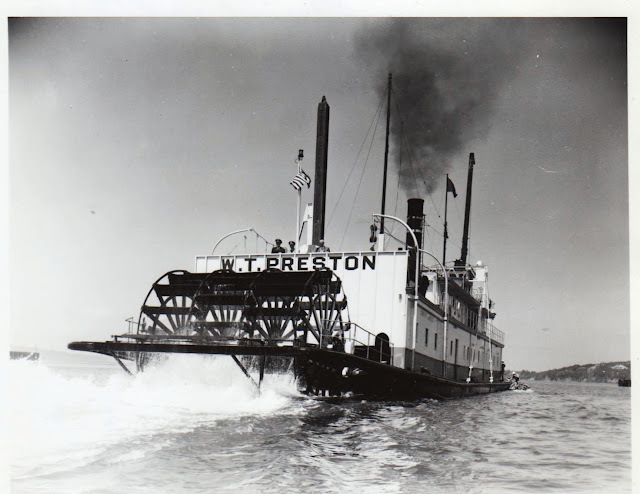 Preston, with its sternwheel kicking up a wake, July 14, 1959. The Preston was home-berthed at the Ballard Locks. Photographer, Dietz. Today we’re focusing on the care and feeding of the crew. The Preston served as home away from home for its crew of 12 to 14 men. Keeping these men fed and happy was a challenging job requiring creativity, flexibility, and good management and budgeting skills, a job that fell entirely to the cook and assistant cook. Many of the men on the Preston rose up through the ranks. Captain Norman A. Hamburg started out as cabin boy. 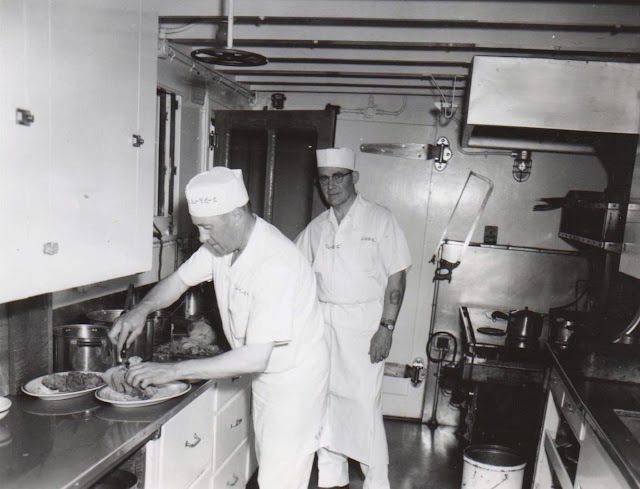 He recalled the difficulty of obtaining and keeping fresh produce onboard in the early days. 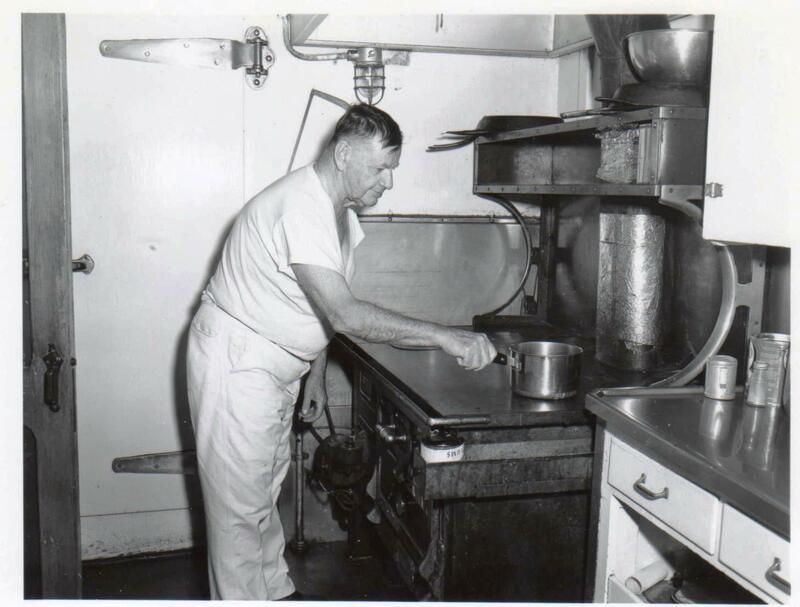 Cook Eddie J. Padden in the galley, surrounded by the tools of his trade. September 19, 1967. By contrast, Lynch cooked on an ancient oil-burning range that had to be started up each morning by one of the firemen on board. Someone told him the range dated from 1893 which, if true, might mean it was inherited from the original Puget Sound snagboat, the Skagit. Such a stove provided radiant heat, but did not offer much in the way of temperature control. 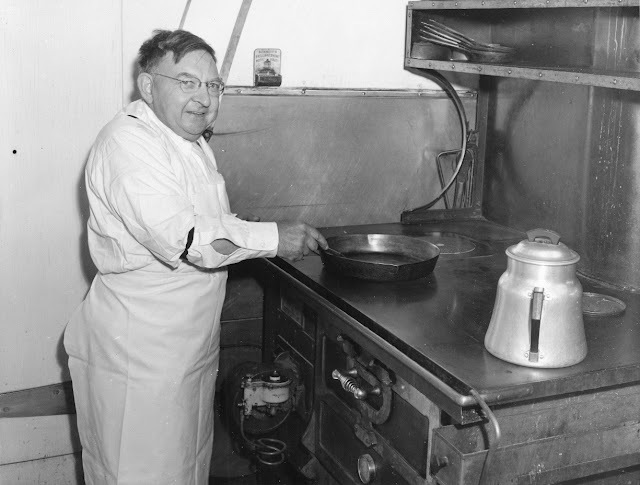 Lynch noted that the oven temperature would quickly rise to about 600 degrees. Lynch recalled one particularly rough crossing. The Preston was designed for work on inland rivers and waterways. In the latter part of her career she was more frequently called upon to work in open water. This was one reason the boat was retired. Noon meal in the wardroom, the officers’ mess. 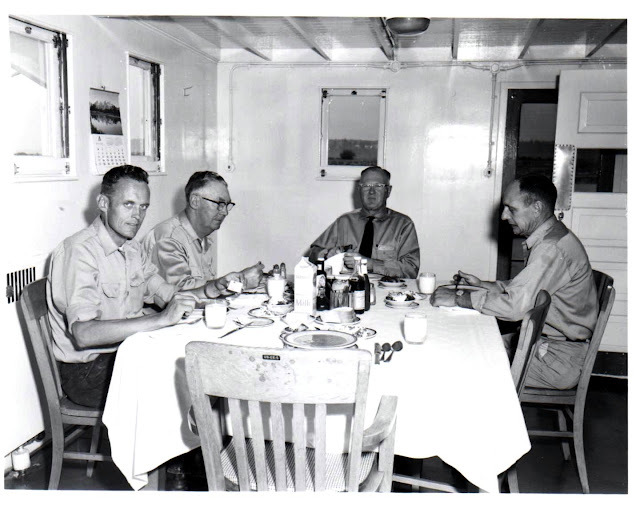 Left to right: William W. Morgan, 2nd Mate; Norman O. Ronning, 1st Mate; Captain Norman A. Hamburg; Elbert D. Becker, Acting Chief Engineer. September 19, 1967. Rydberg received a number of awards for service during his career. At his retirement party on April 7, 1952, he was given a radio equipped with a short-wave band “so he can listen in on ship talk when he gets tired of landlubber programs [as well as] a diamond-studded lapel pin with the emblem of the Corps of Engineers.” (Seattle Daily Times, April 8, 1952). He also received the Exceptional Civilian Service Award. The Anacortes Museum and Maritime Heritage Center preserves a number of photos of Rydberg, along with his prized recipe box complete with recipes. According to the museum, Rydberg was known for his large, hard sugar cookies, which crewmembers would sometimes toss to children along the shore. Rydberg passed away in 1969 at the age of 76. Fritz Rydberg at the ancient oil-fired range and oven. This photo, taken on the day of his retirement party and appearing in the Seattle Daily Times the next day, was probably staged for the cameras. No food in the skillet! Fritz Rydberg is honored on the occasion of his retirement from the snagboat service. 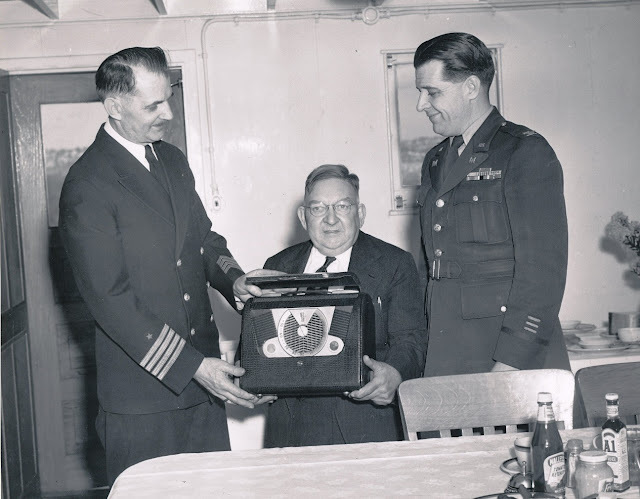 He is presented with a short-wave radio, April 7, 1952. All oral histories referenced are in the custody of the Anacortes Museum and Maritime Heritage Center (as is the Preston, herself); all photos are held in the Corps of Engineers collection, in the care of Friends of the Ballard Locks. And here's a link to some of the history of the Puget Sound snagboats, referred to earlier.